Malayalam films Oraalppokkam is open to interpretation and therein lies its appeal, says Paresh C Palicha. The independent cinema movement, currently being revived in Kerala, has found admirable support in efforts to release fresh, pathbreaking films in government-owned theatres and multiplexes. Oraalppokkam is the latest independent venture to make it to theatres this week. Sanal Kumar Sasidharan’s debut won him the State Award for Best Director. It is difficult to bracket Oraalppokkam since it deals with several overlapping themes. In a way, it comes across as a post-modern take on human relationships where men and women live together without any formal commitment or fidelity. Here we have Mahendran (Prakash Bare) and Maya (Meena Kandasamy) in a longtime live-in relationship. It is broken within a moment when egos clash. In some ways, this film is also about a man’s quest for a Utopia that leaves him deluded in the end. 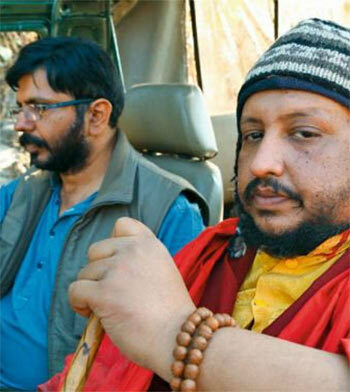 This quest takes the duo across India, making it a road movie too, in a way. The story is philosophical in tone, and goes on to show the havoc man can create on nature in his quest for what he perceives is utopia. the film was shot in the parts of Uttarakhand that were hit by arguably the worst natural disaster in the recent history of India. It also leaves a trail of disconcerted thoughts in the viewer's mind when he gets out of the theatre. The first thing that strikes you is that this is shot with just a fraction of the budget that a usual commercial film uses yet there is bound by no production or performance limitations. Shot in actual locations -- Thiruvananthapuram, Mumbai, New Delhi, or the hostile terrains of the Himalayas -- the film is visually effective and the credit should go to the technical team including camera man Indrajith, sound designers Sandeep Kurissery and Jiji P Joseph (who won the state award for sound designing using sync sound ) though they worked with minimal equipments. It is Prakash Bare as an actor who shoulders the responsibility of communicating the director’s vision to the viewer and he does it with utmost sincerity. We can see the turmoil he is going through in the entire film. Poet Meena Kandasamy's Maya is sketchy. At first she comes across as any other woman who doesn't approve of infidelity but her character becomes a blur as the story progresses. Director Sanal Kumar Sasidharan has said in many interviews that he does not like to explain what he is trying to convey through his work. He is more interested in how a viewer will interpret what he has seen which makes Oraalppokkam open to interpretation and therein lies its appeal.